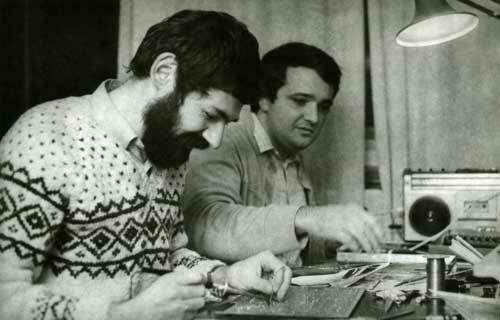 Voja Antonić and his colleague Jova Regasek putting together the Galaksija prototype in 1983. Public domain. 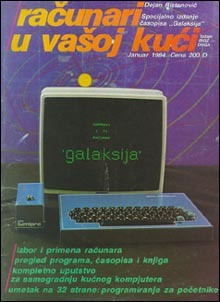 The Galaksija  (Galaxy) computer, created by inventor and author Voja Antonić in 1983 with detailed instructions for anyone to put together a personal computer with standard parts, is nothing less than legendary in the former Yugoslavia. The DIY home computer may not have matched the quality or high-tech readiness of most brand name computing machines of the time, but it inspired a country and a generation to plunge deeper and farther into the IT industry that was just beginning to develop worldwide. As legend would have it, in the summer of 1983, a young journalist with a flare for all things tech and scientific, Voja Antonić , was vacationing in Montenegro. At the time, importing computers and such machinery into Yugoslavia was close to impossible for the average citizen due to complicated customs laws and licenses. Such technology didn't come cheap in the 1980s either. A standard PC in 1983 cost about an average Yugoslav worker's monthly salary, which was among the highest in Europe at the time. Cover of the January 1984 edition of “Računari u vašoj kući” magazine. Public domain. Antonić plunged into some summer reading on the Montenegrin coast that year about a new brand-name computer that had just been released on the global market. As he looked at the schematic, he realized that most of the parts of standard PCs had become readily available at most hardware stores throughout the country. Within months, the young Antonić had put together a schematic for anyone who wanted to build a do-it-yourself computer. He then contacted a few manufacturers of such parts and partnered with them to create DIY packages with all the necessary parts that any ordinary consumer could order for and put together at home. Initially, the team involved believed they could sell as much as several hundred of the Galaksija kits, a number they thought to be highly optimistic but possible. Antonić knew he would also have to publish the schematic in a place where wider audiences could see it, for those who didn't want to order the ready to build Galaksija kit, but would rather purchase the parts on their own. He teamed up with Dejan Ristanović , who was barely 20 years old at the time and putting together a magazine about the latest in PC technology, “Računari u vašoj kući” (“Computers in Your Home”). Together, Ristanović and Antonić released the full diagram and instructions for the Galaksija personal computer in the first January 1984 edition of the magazine, published in December of 1983. Within a year or so, over 8,000 Galaksija kits were sold in Yugoslavia, while the number of those who purchased parts on their own and used the schematic to build their custom Galaksija were never recorded. That same year, Galaksija computers were introduced into elementary schools throughout the country. The year was 1984. Like the ZX Spectrum and other computers of the time, programs were loaded onto the Galaksija from an audiocassette recorder. This gave Jova Regasek, the editor of Računari, an idea for a bold experiment. He got in touch with Zoran Modli, who hosted the show Ventilator 202 on Radio Belgrade. Modli's show was a mix of local bands and contemporary chart music, but he also had an interest in computers, and Regasek's idea was to broadcast the sound of a computer program that listeners could tape and then load up on their home machines. In effect, this was wireless downloading long before the days of wi-fi. In the year of Galaksija's 30th anniversary, every school in Serbia is equipped with computers for students, the Internet penetration rate was close to 65 percent in 2012, and visitors are often surprised to find that wifi is readily available almost anywhere in every city and town in the country. Over one-third of the country's adult population uses the Internet daily, and the statistics are just as or more impressive for Montenegro, Croatia, Macedonia and Slovenia, with Bosnia-Herzegovina lagging somewhat. With much to make up for after the turmoil of the last two decades and the global IT industry developing rapidly, the region has yet to catch up with some other high-tech markets. With the Galaxy to mark its past, many are confident that the region has a bright future ahead.